Almost every major city all around the world has its own public transportation system. These systems can vary a lot from one city to the next, and it can be quite an overwhelming and intimidating prospect for travelers to try and figure out the various maps, schedules, fares, and rules of a transportation system in a city they're not familiar with. Atlanta is a fine example. Georgia's state capital city is a wonderful place to live, work, and visit, home to some beautiful green spaces, impressive architecture, and unique landmarks like the Martin Luther King Jr. National Historical Park, the CNN Center, and the Swan House. However, getting around Atlanta isn't always easy for first-time visitors. Fortunately, once you know the ins and outs of the system, it becomes a lot simpler. Atlanta's main form of public of transport is the MARTA system, with MARTA standing for Metropolitan Atlanta Rapid Transit Authority. Formed back in the 1970s, initially as a network of bus routes, MARTA has grown over the years to incorporate trains too. It's one of the biggest public transport systems in the entire United States. Both light rail streetcars and heavy rail trains are in operation on Atlanta's MARTA system, and you can use MARTA trains to get anywhere around the city and visit all of the various major landmarks and points of interest. 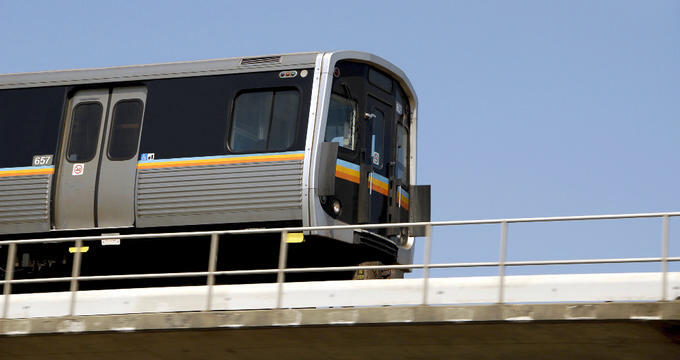 The MARTA train system features four lines: Red, Green, Gold, and Blue. This color-coded system makes it very easy to differentiate between each line and plan your route, and there are 38 different stations served by the various lines throughout the city, formed in a cross-like shape. The Blue and Green lines run from east to west, while the Red and Gold lines run from north to south. It's very important to note that, unlike many other train systems in major cities, the MARTA trains do not run round the clock. The service ends at approximately 1am each morning, with the first trains of the day setting off at 4.45am on weekdays and 5.50am on weekends and holidays. There are also line-specific rules and aspects to be aware of. For example, the route of the Red Line becomes limited after 8.30pm, and the Green Line will serve additional stations during the week. A good tip for riding MARTA trains in Atlanta is to consult the MARTA official website. There, you'll be able to consult a full map of the MARTA train network and see all of the various lines and stops. You'll also be able to see full and live train schedules, learning more about each train. The trains tend to run every 10 minutes during the busiest times of day, like from 6-9pm or early in the mornings, but will run every 20 minutes for the rest of the day. You can download the MARTA to Go app to see live information and consult the MARTA train map on your mobile device. MARTA trains have a standard one-way fare of $2.50. This ticket will last for three hours and let you travel in one direction on the MARTA train system, making up to four transfers along the way. MARTA train passengers will need to buy their tickets in the form of a Breeze Card, which allows you to pass through the ticket gates. If you're only visiting the city temporarily, you can buy a paper card, but if you're having an extended stay in Atlanta or plan on coming back again in the future, a full plastic card is the better option. You can then use your Breeze Card at the ticket gates, placing it on the blue circle in order to open the gate. Cash or cards can be used to add additional ticket fares onto your Breeze Card and there are various additional options like round-trips and full-day travel passes. When you arrive at your destination, you can simply tap your card once more on the circles to exit. It’s a simple and easy process, but if you have any problems, the station staff will be standing by to help. There are some rules that all passengers need to be aware of and follow while riding the MARTA trains. For example, passengers are not allowed to eat, drink, or smoke while riding the MARTA trains. No pets are allowed on board except service animals or small animals in secure carriers, and it's important to respect the trains and avoid littering or vandalizing them in any way. Passengers are not allowed to listen to music through smartphone speakers or any other loud device, so headphones must be used at all times. In addition, as with any major public transportation network, passengers are encouraged to be polite and courteous to one another, standing aside for busy commuters to pass by, offering seats to people who need them, and avoiding taking up multiple seats with bags and belongings.